I hope you are all well. 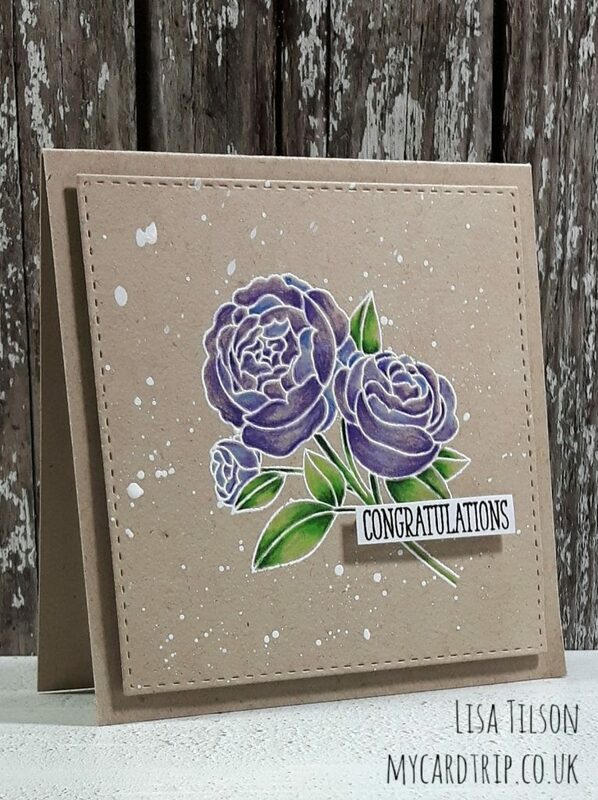 I am back today with a congratulations card which I have recently sent to a friend on IG. At the time of making the card and writing this post, I was still struggling to think of cards to make. And I still feel overwhelmed with lots of unused craft supplies, too many ideas, no focus, and a whole lot of other stuff going on outside of my happy cardmaking world, like trying to move house, a bad back, and then a wonderful holiday which meant I didn’t make a card for almost 5 weeks. So when I get like this, I sometimes go back and look at cards that I have made in the past and I remake them, usually making a few changes. I had previously coloured this image as part of the 30 Day Colouring Challenge and had actually sent it to my Mum. So I adapted the colours, changed the sentiment to fit the occasion and spattered some white paint over it! The image was stamped with Versamark ink, heat embossed with white embossing powder and coloured with my Polychromos pencils. I then stamped and cut the sentiment ready to place on top. I also cut a mask and then added some white gouache paint to my acrylic block and used a paintbrush to flick paint off the edge onto the masked panel. I think I got a bit carried away here! And this probably looks more like a wedding card than anything else, but hey, let’s not get too particular here. It is a card and that is enough for now! After spattering paint, I removed the mask and popped the sentiment on and lastly added some craft foam to the back of the stitched panel. 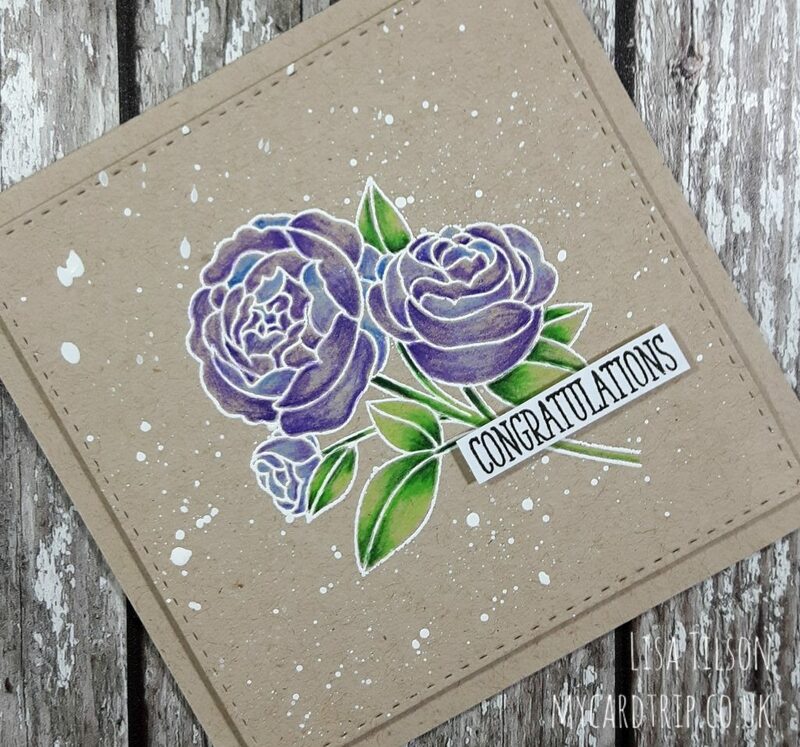 I love making square cards, and the image is the perfect size for this 4.25″ card. So, that’s it for today. Let’s hope my mojo comes back soon :). Thank you as always for stopping by and please feel free to leave me a comment as I love to hear from you all. 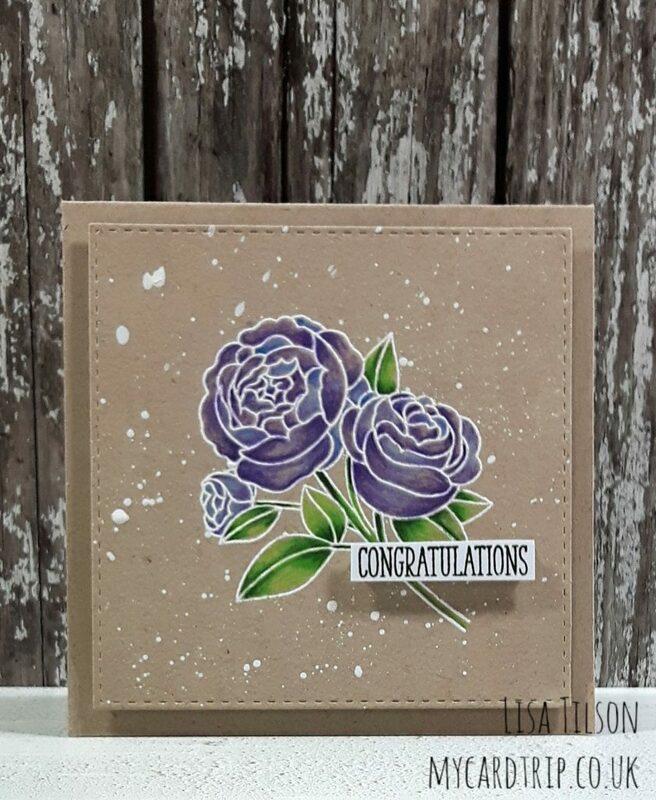 A beautiful card as always Lisa and though you are struggling with inspiration your style still comes through to perfection. I hear where your coming from with unused stuff, sometimes I just sit there looking at what I havent touched yet and then see what is being released and I feel so over whelmed, the companies are so over bombarding us with stamping, dies etc its being negative in a way. 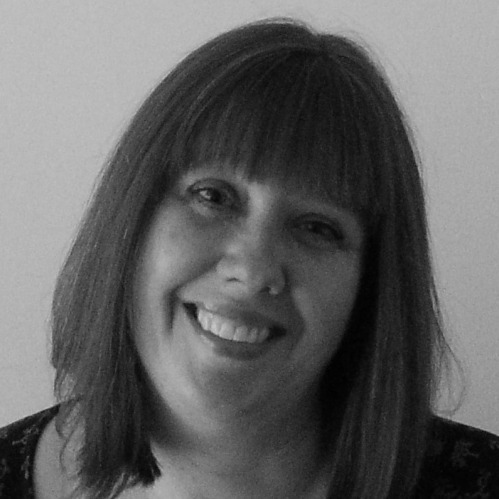 I am even thinking of just going off Instagram there is so much new stuff on there and of course we see so many amazing designers showing us their clever ideas. I have to now just look at what they are doing and think I can do that with what I have. Honestly and stop looking or I feel so much I want and I am missing out it gets so stressful.